At the occasion of Kulturnat (culture's night), the Copenhagen IT University is organising an introductory workshop for intelligent textiles. If you want to sew your own soft circuit or play with heat-sensitive colors, that's the place to be on the 12th of october 2012. No prerequisite is required other than curiosity! 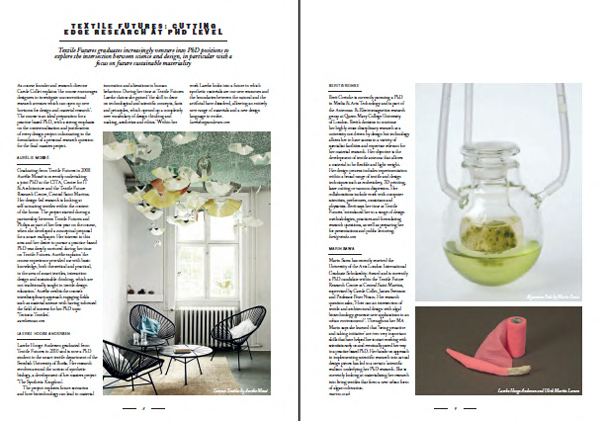 DesignLab at the IT University of Copenhagen between 18:00 and 23:00 for Kulturenat on the 12th October 2012. A new website for PhD courses in Denmark was launched first September 2012 to provide a better overview of the many PhD courses the Danish universities offer individually and in cooperation with each other. I thought I would just mention it to you, though it is not dedicated to design research especially. However, the Royal Danish Academy of Fine Arts, School of Architecture, Design and Conservation ( KADK) will soon upload information about its own courses. For instance, it can be a good place to source academic writting if not topic related trainings. A nice teaching opportunity that may be of interest for some of you to spread the textile vibe? The Department of Art & Art History at Stanford University seeks to make an appointment of a new emerging practices/designer working at the intersection of contemporary art and design at the tenure track level of Assistant Professor. Prospective candidates might create works of art/design in areas such as social structures, community collaborations, interventionist strategies, architecture, interaction design, future technologies, relational aesthetics, environmental remediation, alternative economies, or other emerging areas of contemporary art and design practice. Candidates should hold an MFA degree, and also should have exceptional credentials as an artist, designer and experience as a teacher at a college level, demonstrating an extensive familiarity with contemporary emerging media in art and design. The successful candidate will have a distinguished body of work and an accomplished public interaction/exhibition record. 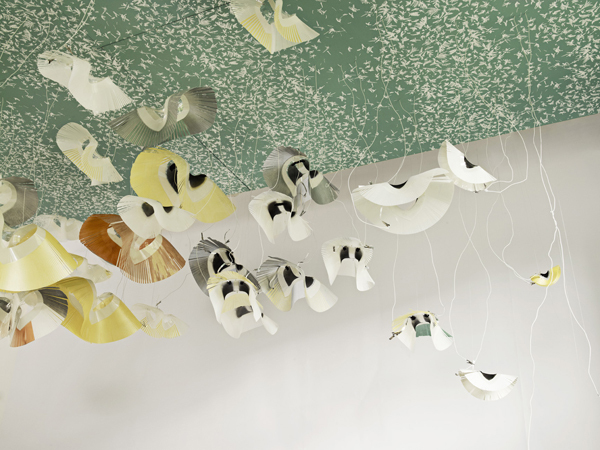 He or she will have a genuine commitment to teaching design at both the graduate and undergraduate level and will have a global perspective on the role of design and contemporary art. He or she will be prepared to build a curriculum that will reflect that perspective. The successful candidate will be expected to participate fully in Stanford's art practice program, working with both undergraduate and graduate students, and to provide leadership as the Department of Art & Art History's representative in the Stanford Joint Program in Design, a collaborative graduate program with Stanford's Department of Mechanical Engineering. Application deadline: October 15, 2012. Please send a letter of introduction and curriculum vitae to Chair, Emerging Practices Design Search Committee, Department of Art & Art History, Stanford University, Stanford, CA 94305-2018. No electronic submissions will be accepted. For further information, please click Apply Online below. Stanford University is an equal opportunity employer and is committed to increasing the diversity of its faculty. It welcomes nominations of and applications from women and members of minority groups, as well as others who would bring additional dimensions to the university's research and teaching missions. Most of us are currently writting up or about to defend their PhD, which explains why the blog is fairly silent these days. Yet the Textile Futures PhD's community is growing slowly but surely. The last edition of the MA Textile Futures' catalogue is celebrating this expansion by introducing some of its former students currently engaged in doctoral research accross UK and Scandinavia around the federating topic of future sustainable materiality. 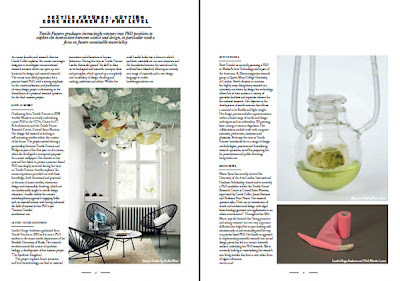 Discover Lærke Hooge Andersen, Berit Greinke, Marin Sawa and Aurélie Mossé's researches in the 2012's catalogue pp.10-11. On the 10th of May, I will have the pleasure to present TFRC's research as part of the seminar series 'Matérialité' organised by LACTH, the Conception, Territory & History research lab of Ecole Nationale Supérieure d'Architecture et de Paysage of Lille. The presentation entitled 'Textiles futurs: Imaginer, matérialiser un nouveau paysage architectural' will showcase TFRC's research related to textile architecture & sustainable design including Marin Sawa, Jane Scott, Carole Collet's research as well as my own practice. The lecture will be in French. By the use of more and more complex building automation and communication technologies architecture increasingly turns into adaptive systems, which react to the environment and the user. Architects and designers have to use these technologies also as a design medium and develop a digital sensuality which is more than the simulation of our physical environment. 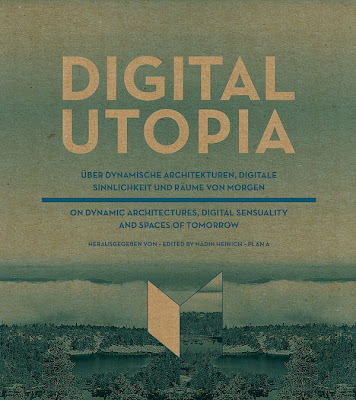 At the occasion of the launch of the book Digital Utopia, We-are-plan-A is organising an evening talk at the Technical University of Munich entitled Digital Play. Together with´Fabian Hemmert (Design Research Lab, Berlin), Conny Freyer (Troika, London) and Dr. Silke Claus (bayern design), I will address the playful and sensual experiences and possibilites offered by digital technologies. This evening is the last of a total of 4-part series of events linked to the publicaiton of "Digital Utopia - On dynamic architectures, digital sensuality and spaces of tomorrow" to be released in May 2012 by the Academy of Arts, Berlin. Marking the publication of the title Persistent Modelling by Routledge, edited by Phil Ayres, this seminar draws together members of CITA and current CITA collaborators who have contributed to the book. The seminar will examine and discuss the relationship between representation and the represented through the notion of persistent modelling. This notion is not novel to the activity of architectural design if considered as describing an iterative engagement with design concerns – and evident characteristic of architectural practice. But the persistence in persistent modelling can also be understood to apply in other ways, reflecting and anticipating extended roles for representation. In addition, this seminar will provide critical insight into the use of contemporary modelling tools and methods together with an examination of the implications their use has within the territories of architectural design, realisation and experience. The seminar programme can be found here.